Solar storms can affect the Earth's magnetic field causing small changes in its direction at the surface which are called 'magnetic storms'. A magnetometer operates like a sensitive compass and senses these slight changes. 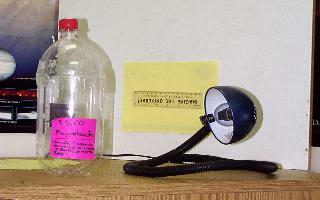 The soda bottle magnetometer is a simple device that can be built for under $5.00 which will let students monitor these changes in the magnetic field that occur inside the classroom. When magnetic storms occur, you will see the direction that the magnet points change by several degrees within a few hours, and then return to its normal orientation pointing towards the magnetic north pole. Please refer to the attached primer Studying the magnetosphere in the Classroom for additional background information. The students will create a magnetometer to monitor changes in the Earth's magnetic field for signs of magnetic storms. The following instructions provide directions for making a simple magnetometer. For various enhancements, please have a look at the Mark 2 Design page which uses the same setup but with a laser pointer. Also, in the January 1999 issue of Scientific American, there is a design for magnetometer that uses a torsion wire and laser pointer developed by amateur scientist Roger Baker. You can visit the Scientific american pages online to get more information on these other designs. Get this from the Magnet Source. They offer a Red Ceramic Bar Magnet with 'N' and 'S' marked. It is 1.5" long. Price $0.48 each. Catalog Number DMCPB. Call 1-800-525-3536 or 1-888-293-9190 for ordering and details. A mirrored dress sequin, or small craft mirror. Darice, Inc. 1/2-inch round mirror, item No. 1613-41, $0.99 for 10. An adjustable high intensity lamp with a clear...not frosted..bulb. Clean the soda bottle thoroughly and remove labeling. Slice the bottle 1/3 of the way from the top. Pierce a small hole in the center of the cap. Fill the bottom section with sand. Cut the index card so that it fits inside the bottle (See Figure 1). Glue the magnet to the center of the top edge of the card. Glue a 1 inch piece of soda straw to the top of the magnet. Glue the mirror spot to the front of the magnet. Thread the thread through the soda straw and tie it into a small triangle with 2 inch sides. Tie a 6 inch thread to the top of the triangle in #9 and thread it through the hole in the cap. Put the bottle top and bottom together so that the 'sensor card' is free to swing with the mirror spot above the seam (See Figure 2). Tape the bottle together and glue the thread through the cap in place. Place the bottle on a level surface and point the lamp so that a reflected spot shows on a nearby wall about 2 meters away. Measure the changes in this spot position to detect magnetic storm events (See Figure 3). For detailed instructions about how to set-up the magnetometer and record data, have a look at our Set-up and Data-Taking Procedures file. As a supplementary activity in applied geometry, you may want to show that the angular deflection you will see on the wall will equal TWICE the actual angular deflection of the magnet and its deviation from magnetic north. Here's how to think about this problem. or 0.28 degrees. If you prefer using minutes of arc ( there are 60 in a degree) then this equals 60 x 0.28 or 17.2 minutes of arc. Here are some records of data taken with this magnetometer. Note that the 'Relative Position' column is an arbitrary numerical scale, in this case numbered in inches. Only the differences between pairs of numbers are significant and correspond to the magnetic deflection! It is important that when you adjust the location of the sensor card inside the bottle that its edges do not touch the inside of the bottle. Be sure that the mirror spot is above the seam and the taping region of this seam, so that it is unobstructed and free to spin around the suspension thread. The magnetometer must be placed in an undisturbed location of the classroom where you can also set up the high intensity lamp so that a reflected spot can be cast on a wall within 1 meter of the center of the bottle. This allows a 1 centimeter change in the light spot position to equal 1/4 degree in angular shift of the magnetic north pole. At half this distance, 1 centimeter will equal 1/2 a degree. Because magnetic storms produce shifts up to 5 or more degrees for some geographic locations, you will not need to measure angular shifts smaller than 1/4 degrees. Typically, these magnetic storms last a few hours or less. To begin a measuring session which could last for several months, note the location of the spot on the wall by a small pencil mark. Measure the magnetic activity from day to day by measuring the distance between this reference spot and the current spot whose position you will mark, and note the date and the time of day. Measure the distance to the reference mark and the new spot in centimeters. Convert this into degrees of deflection for a 1 meter distance by multiplying by 1/4 degrees for each centimeter of displacement. You can check that this magnetometer is working by comparing the card's pointing direction with an ordinary compass needle, which should point parallel to the magnet in the soda bottle. You can also note this direction by marking the position of the light spot on the wall. If you must move the soda bottle, you will have to note a new reference mark for the light spot and the resume measuring the new deflections from the new reference mark as before. Most of the time there will be few detectable changes in the spot's location, so you will have to exercise some patience. However, as we approach sun spot maximum in the year 2000, there should be several good storms each month, and perhaps as often as once a week. Large magnetic storms are accompanied by major aurora displays, so you may want to use your magnetometer in the day time to predict if you will see a good aurora display after sunset. Note: Professional photographers use a similar device to get ready for photographing aurora in Alaska and Canada. This magnetometer is sensitive enough to detect cars moving on a street outside your room. With a 1-meter distance between the mirror and the screen, a car moving 30-50 feet away produces a sudden deviation by up to 1 inch from its refeence position. The oscillation frequency of the magnet on the card is about 4 seconds and after a car passes, the amplitude of the spot motion will decrease for 5-10 cycles before returning to its rest position. You can even determine the direction of the car's motion by seeing if the spot initially moves east or west! Also, by moving a large mass of metal...say 30 lbs of iron nails...at distances of 1 meter to 5 meters from the magnet, you can measure the amount of deflection you get on the spot, and by plotting this, you may attempt to recover the 'inverse-cube' law for magnetism. This would be an advanced project for middle-school students, but they would see that magnetism falls-off with distance, which is the main point of the plotting exercise. Just as students may be asked to monitor their classroom barometer for signs of bad weather approaching, this magnetometer will allow students to monitor the Earth's environment in space for signs of bad space weather caused by solar activity. Visit our page of links to professional Magnetic Observatories to see the latest measurements from stations around the world.